Damian and I have been working together since summer 2017 on a related project, studying the phylogeography of the common sea star, Asterias forbesi, in the Northwest Atlantic. This species ranges from about Prince Edward Island in Canada south to Florida. As part of our Student-Faculty Collaborative scholarship project together, we extracted, amplified and analyzed the sequences of more than 80 sea stars collected from six different locations across the species range. We found some very interesting results and we are currently in the process of writing these up for publication. In particular, we found extremely low genetic diversity in the mitochondrial DNA gene region we sequenced, so much so that some individuals from P.E.I. have the exact same sequence as individuals collected from North Carolina. This lack of genetic diversity is indicative of a genetic bottleneck. One of the implications of this lack of diversity is that if a disease were to arise in this species, the entire range could be susceptible. 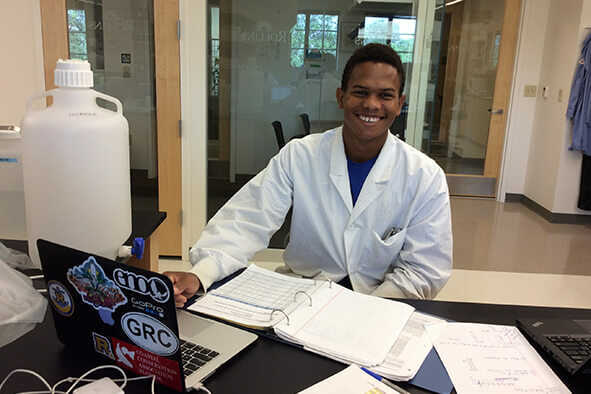 Damian and I will be continuing to work with this species and its sister species, Asterias rubens, in the academic year 2018-2019 as he does a full year of independent research in my lab on a related question.